SF Journal, SFKorean, 업소록(MoKorea.com/웝사이트 모바일) 광고는 한인사회에 가장 빠르게 전달됩니다. 고 품질 매거진 SF Journal과 최대 한인 포탈사이트, 북가주에서 가장 많이 사용하는 인터넷 한인업소록에서 최고의 광고효과를 체험하세요. 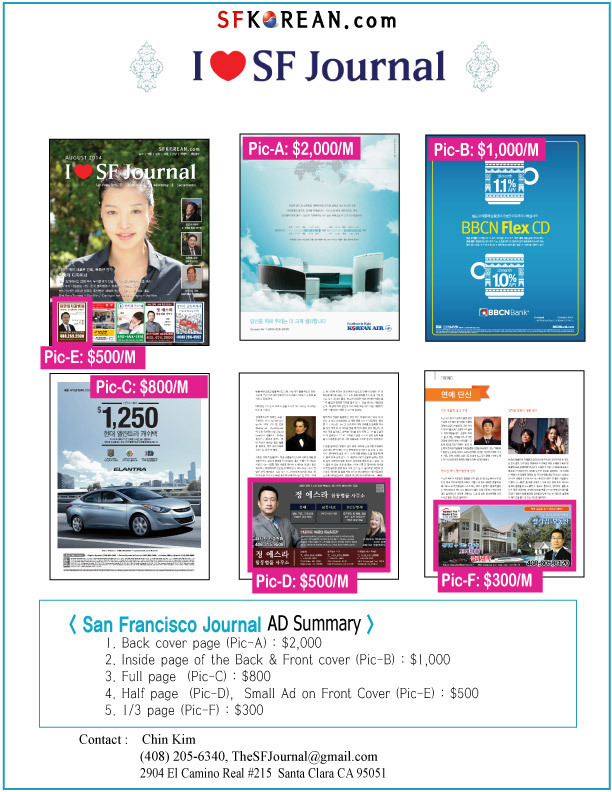 SFKorean.com can bring the high-impact advertising solution to meet any of your marketing needs within the Korean American community. Bringing your product or service onto SFKorean.com not only puts it in the frontline of Northern California's Korean Community, it builds brand awareness and will deliver the results you're looking for, whether that's more traffic on a website, or launch a new product or service. 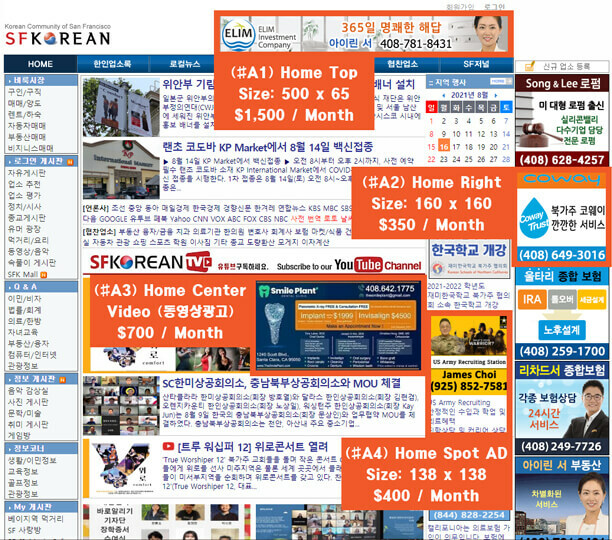 The SFKorean.com audience is more than just a Korean audience. Our users are affluent, intelligent and influential; as an online community, they share and trade ideas and opinions, making them a desirable audience to reach. 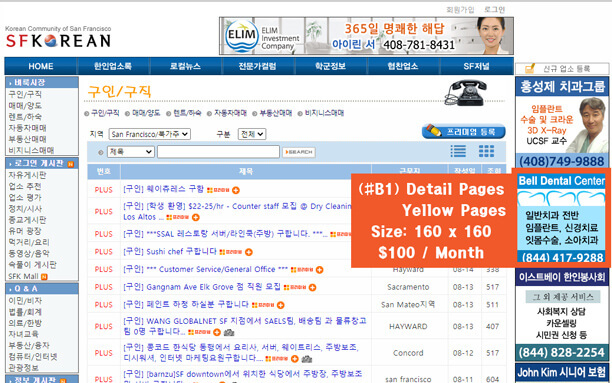 As the most popular Korean community website in the United States, SFKorean.com makes this audience reachable for your company. 자세한 광고비에 대한 문의는 해당지역에 문의 바랍니다. 상기가격은 GIF 또는 JPG파일에 한합니다. 에니메이션이나 Flash 형태를 원하시면 별도로 문의하시기 바랍니다. 광고 이미지는 항상 바꾸실 수 있습니다. 이메일(mysfkorean@gmail.com) 또는 전화 문의(408-205-6340)를 받습니다.